The United States, a usual volunteer to extend support after every natural disaster in Iran regardless of tense relations between the two countries during the past decades, has not been reported to have seized the opportunity on the world stage to make a publicized offer of help. On March 25, the Persian Twitter account of the State Department made a short announcement offering sympathies and a one-sentence expression of readiness to help, but senior U.S. officials have not officially made any serious offer. European states as well as Iran’s neighbors, particularly the wealthy Persian Gulf states have also not made any official offers of help. Or, if any offer has been made, the helpers have not said anything, and Iran has not acknowledged receiving them. British, German and French diplomats in Tehran have expressed their sympathies, but no one at higher level has made an official offer of help; let alone sending actual material support. Turkish charities have offered assistance according to Daily Sabah newspaper and five trucks are on their way, but this is negligible considering the extent of the damage. This is a dramatic change in the behavior of the world community. 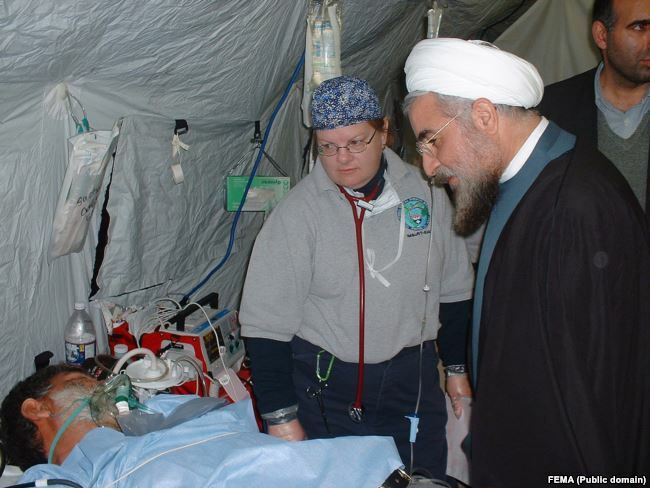 In late 2003 when a major earthquake caused devastation in Bam in southeast Iran, over 60 countries rushed to help and the United States set up a makeshift hospital in Bam to help the wounded and save lives, Iranian news agencies reported at the time. The hospital was only part of the assistance extended by the United States at the time. Food, medicine and other supplies, as well as rescue dogs were despatched to help Iran, although diplomatic ties between Tehran and Washington had been cut off in early 1980s. At that time, Iran’s President was reformist Mohammad Khatami who had initiated the idea of “dialogue among nations” during a speech at the UN General Assembly. Ten years later, U.S. media remembered this picture after Rouhani had a conversation over the phone with President Barack Obama in 2013 after another UN General Assembly meeting. Now, only six years later, very little seems to have remained from the sense of sympathy, at least in public domain. Europeans and Americans and regional counties seem to have had enough of hate-speech and words of abuse by Iran’s Supreme Leader Ali Khamenei. Even Russia and China, Iran’s diplomatic supporters have not sent any assistance to help victims or assist the government in dealing with floods. In addition to Iran’s diplomatic isolation, U.S. sanctions might also be a factor in inhibiting material assistance. The United Nations Office for the Coordination of Humanitarian Affairs (OCHA) said in a statement that it was ready to offer help to Iran, but “challenges caused by unilateral sanctions will affect the UN response and the accountability of UN to deliver the appropriate support”, Reuters reported on March 26. Iran has not accepted calls for help in disasters, except when the events were overwhelming like the June 2000 earthquake in Roudbar in northern Iran and the 2003 quake in Bam. The current floods are larger in scale and have affected more people although the casualty toll may be smaller. Tens of thousands have lost their homes, farmlands and work places and the Iranian government does not appear to be capable of offering much help although Rouhani has been promising compensation. Hundreds of thousands of people had to evacuate their homes in northern, western and southwestern Iran, where hundreds of towns and villages are submerged. However, for a government that has failed to pay workers’ wages, pensioner’s pension and investor’s assets in many cases during the past year, compensating losses and damages caused by the March floods seem to be too much to promise.